Based on a 19th century Portuguese novel in the sprawling, epic tradition of Hugo and Dumas, Mysteries of Lisbon is a haunting, gorgeously photographed film masterpiece and one of the crowing achievements of the late Chilean-born director Raul Ruiz. Don’t let the four-hour-plus running time time deter you. Once you are drawn into Mysteries‘ dream-state rhythms, you will not be able to pull away. Indeed, “life is a dream” is one of the classic themes in this movie about Joao, a 14-year-old orphaned boy of mysterious origins at a Lisbon Catholic school. The school’s director, the enigmatic Father Dinis, seems to have a special connection with Joao, and after the boy suffers a seizure, the priest begins to help him unravel his past. This journey is the heart of the film, and it moves from Portugal to Italy, France and, finally, Brazil, covering wars, duels, romance and treachery. Ruiz’s camera languorously tracks through palaces and intrigues, capturing in exquisite period detail the dance of a decaying aristocracy as underlings observe it all from dark corners. This is Portugal centuries after the glory days of De Gama — a noble title is no guarantee of wealth, palaces are graying and gardens overgrown. The past is always looming as in a man’s personal shrine adorned with his mother’s skull. The black fatalism of Iberian Catholicism nips at the heels of personal happiness: a women feels compelled to forgive her abusive husband as he dies, renounce her inheritance and enter a convent. Those who prosper are those who can re-invent themselves, like the cutthroat who comes to embody true noblesse. And romantic melodrama is undercut in the film by touches of the absurd. During a scene of feminine revenge, a servant keeps appearing with a strange neurological ailment that causes him to constantly run in short, bird-like steps. 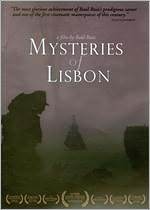 The acting in Mysteries of Lisbon is excellent in an understated, Robert Bresson-like manner. Of particular note are Joao Luis Arrais as the boy Joao and Jose Afonso Pimental as his adult incarnation, Adrian Luz as Father Dinis (in all his incarnations) and Clotilde Hesme as a scorned hysteric akin to Mozart’s Donna Elvira. Also fine is Ricardo Pereira as a precursor of the modern anti-hero. At the end of the four-hour-plus Mysteries of Lisbon, I watched it again. There’s an endorsement for you. The DVD’s substantial assortment of bonus materials were unavailable for review. Based on the plot, it sounds more along the lines of Federico Garcia Lorca. Nice, and would love to see it but will wait for the Walmart $9.95 version. Any time a DVD gets to three or four times the movie ticket price, the movie has to be a 5-times Oscar winner or the case has to be gold plated! When will they learn that these prices just mean that people will either not buy or they will download a pirate copy. Silly, silly.